This week was an awesome week! It’s truly a Fri-Yay!!! If you saw my posts on Instagram and Facebook yesterday, you know I shared my birthday goals and did some celebrating. Today the party is continuing. While you all are reading this, I’m on my way to Disneyland! Thinking of Disneyland is what made me think about this Friday Favorite. I’m a planner. I have my outfits and makeup style usually planned out well in advance of an upcoming occasion. And I’ve been giving a good amount (okay way too much) thought to my makeup for Disney. I want to make sure I’m applying sunscreen and keeping my makeup on point. Also, I like simplicity. I don’t want to tote a makeup bag around with me and I want products that last literally all-day. I love makeup! So I am excited to share something that I consider a game changer. When I first had to add sunscreen to my daily routine I was nervous that my makeup would “melt” or move from a dewy glow to full-on shine. Luckily a product I’ve had in my arsenal for months has kept my makeup in the dewy category. Which amazes me because the sunscreen I apply is super thick. Also, in Hawaii, this product kept my makeup in place despite the humidity. 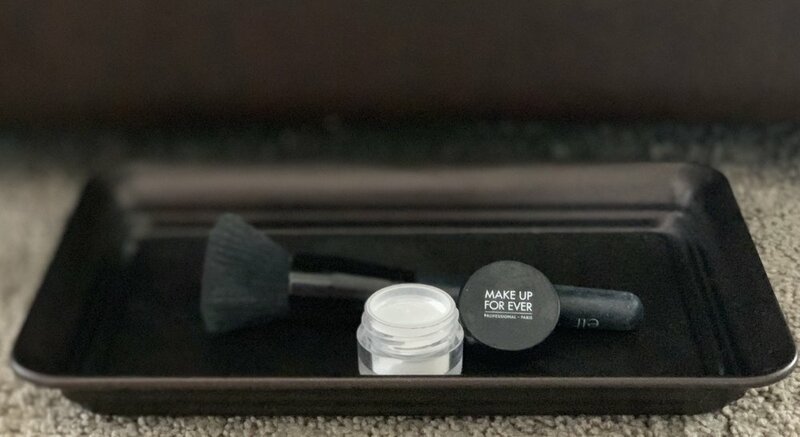 I’ve been using Make Up For Ever microfinishing loose powder in translucent. I also use the brush you see in the pictures to apply the powder. The brush is from Target and I think it was one of the $2.99 brushes. Major score! So I am pretty sure that the sunscreen/makeup combo I came up with will work brilliantly with the powder. Just think about it, if this works at Disney then keeping my makeup looking fresh is achievable anywhere. Do you have any makeup products that you think others should try? We’d love to hear them, so please share.